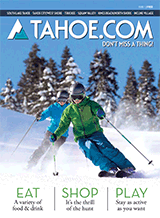 Like the Tahoe.com Facebook page to stay connected! LIVE LOCAL UPDATES! Subscribe to our newsletter. 20% Off for Locals on "Local Mondays"
Enjoy 20% off “Locals Monday” must show ID that lives in 60 mile radius. Must show ID that lives in 60 mile radius. © 2019 SwiftOne, LLC. All rights reserved. Powered by the OneBoat® Community Content Management System. By working together we achieve more than by working alone.